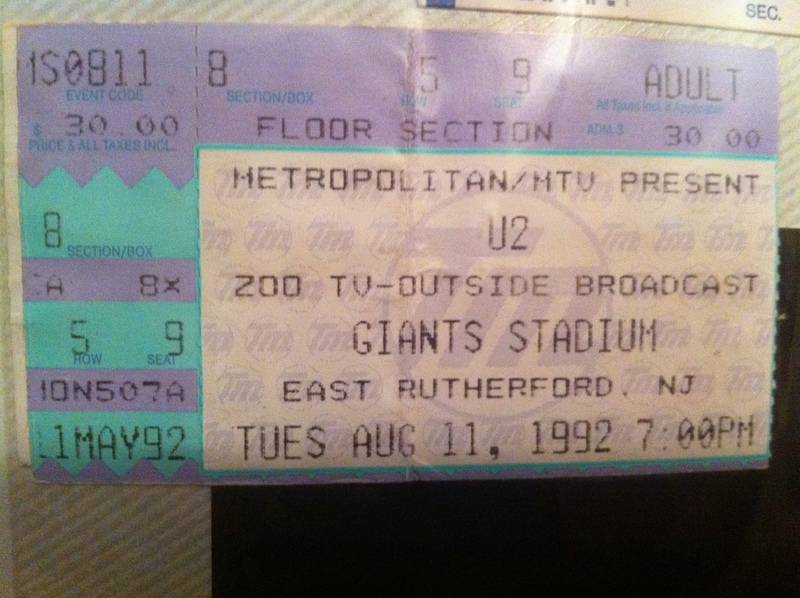 On August 11, 1992 three friends and I drove up to New Jersey for the official opening of the ZooTv Outside Broadcast tour at Giants Stadium. Opening night had been pushed back one night to August 12th. Mike and I went over to the stadium anyway and ended up sneaking in and getting up on the stage and touching the trabants, which were used to light the stage. We eventually got kicked out of the stadium. We tried to figure out where U2 was staying. 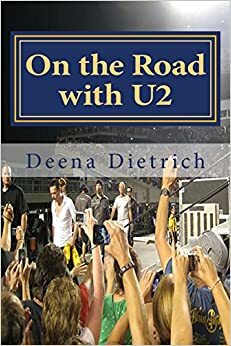 Even though it was August, it was cold at night, so while waiting on the curb for U2 to show up at the hotel, we huddled next to a bus keeping warm from the fumes. There were a bunch of fans standing outside Giants Stadium on the afternoon of August 12th waiting for U2 to arrive. Bono came out and went down the line talking with each of us, signing autographs and taking pictures. 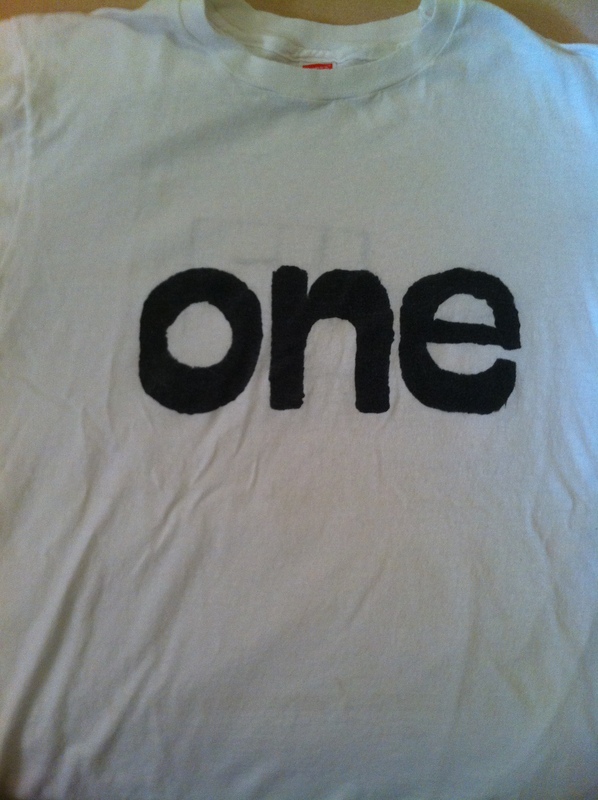 When Bono came to me, he noticed the tee shirt I had made with ‘One’ on it. Then I threw my camera to Mike, so he could take a picture of me and Bono, both with our big sunglasses. Bono’s head is on my shoulder. It’s a great picture! 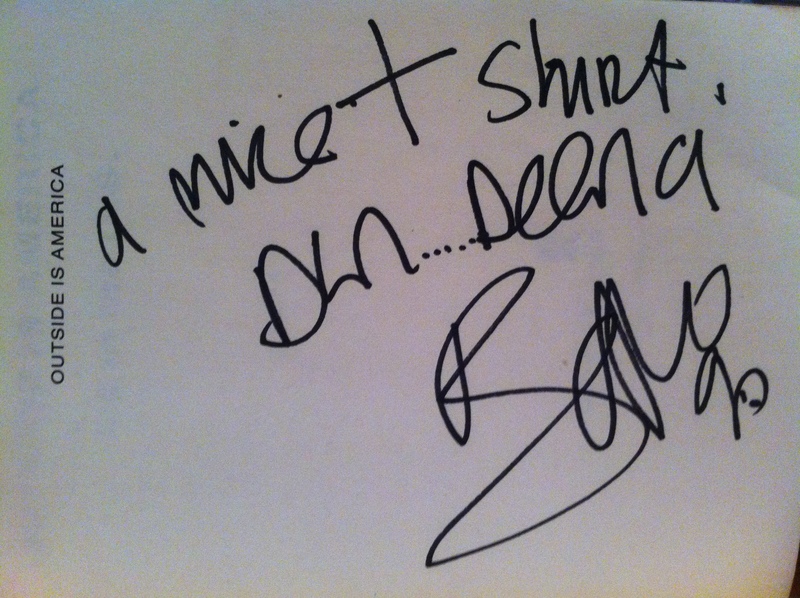 He autographed it a few days later in DC. And if that wasn’t enough, Larry drove by us on his motorcycle and waved. He didn’t stop unfortunately, but I did get a picture. Then I ran away screaming – he just has that affect on me. I wouldn’t meet Larry for another 9 years. Our seats for opening night on August 12, 1992 were in the second section on the floor in the fifth row. Larry sang Dirty Old Town as only he can! I was so excited that Jonathan tried to hold me back, so I hit him causing him to fall off his chair. Lou Reed joined U2 on the b stage for Satellite of Love, and his performance was used for the rest of the tour via video. ZooTv Outside Broadcast Tour opener Set List (8.12.92 Jersey): Zoo Station, The Fly, Even Better Than The Real Thing, Mysterious Ways, One-Unchained Melody, Until The End Of The World, Who’s Gonna Ride Your Wild Horses, Dirty Old Town, Trying to Throw Your Arms Around the World, Angel of Harlem, When Love Comes to Town, Satellite Of Love, Bad-All I Want Is You, Bullet The Blue Sky, Running to Stand Still, Where the Streets Have no Name, Pride, I Still Haven’t Found-Stand By Me, Desire, Ultraviolet (Light My Way), With or Without You, Love Is Blindness. The next night on August 13th, we were in the front floor section in the 8th row. 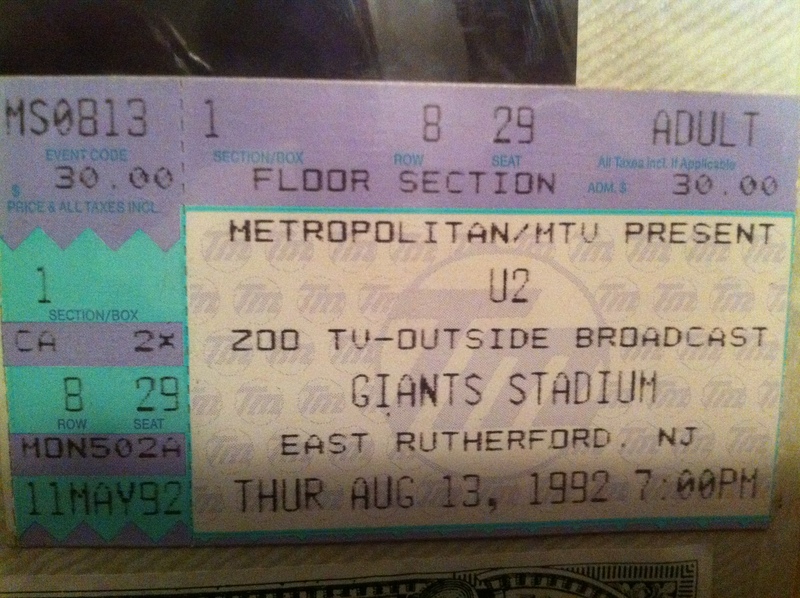 I remember running past security to get to the B Stage as Bono was walking down. 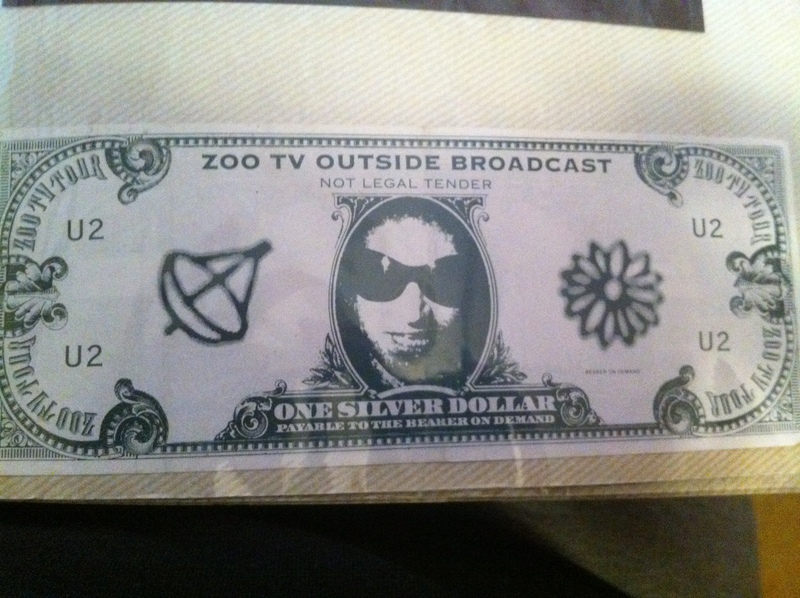 I got a Zoo Dollar that night as they flew through the air during Desire. ZooTv Jersey 8.13.92 Set List: Zoo Station, The Fly, Even Better Than The Real Thing, Mysterious Ways, One-She’s a Mystery to Me, Until The End Of The World, New Year’s Day, Trying to Throw Your Arms Your Arms Around the World, Angel Of Harlem, When Love Comes To Town, I Still Haven’t Found , All I Want Is You, Sunday Bloody Sunday, Bullet The Blue Sky, Running to Stand Still, Where the Streets Have No Name , Pride, Desire, With or Without You, Love Is Blindness. 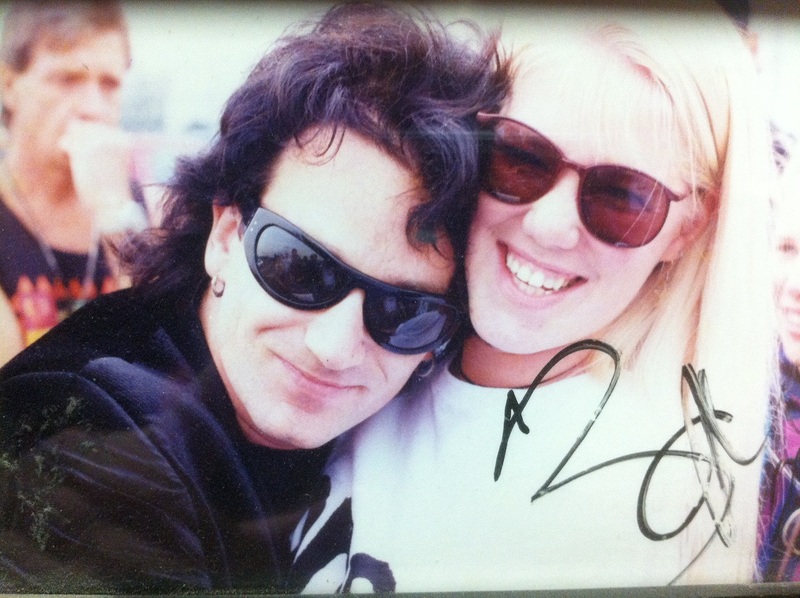 Wow, you are really lucky… Someday, I wish to meet Bono! thank you. you should read some of my later experiences on the elevation, 360 and ie tours.